A World War Two emergency coast defence battery survives largely intact together with two ancillary structures on the cliff top at Mundesley. It has been visited on the ground and is also visible on aerial photographs; the latter indicate that it was constructed between 30 July 1941 and 4 January 1943. It consists of two gun emplacements which held ex-Naval 6-inch guns, projecting off an integral, semi-subterranean accommodation and storage block. 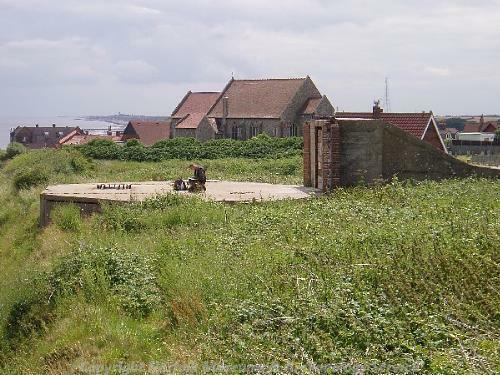 Three ancillary buildings (two of which survive, one as a garden shed) are visible on wartime photographs. One of these was probably a battery observation post; the two on the landward side of the battery have been described as generator houses. The battery was put on 'Care and Maintenance' in 1944, and its guns removed in late 1945 or early 1946. Defensive structures, World War II. Concrete entrances lead down to underground rooms. Seen E. Rose 18 October 1978. In fact, mountings for 2 six-inch guns; concrete circular platforms with bolt rings for gun attachments. Brick and concrete entrances lead to row of semi-subterranean rooms now flooded connecting the two. E. Rose, 27 October 1982. With the demise of the battery at Brancaster (NHER 31113), this is probably the only one left intact in Norfolk. D. Gurney (NLA), 28 February 1995. Condition very much as in 1982, and air photographs TG 3136, D-E. Most of the entrances have been bricked up, but a number of the closures have been breached by sizeable holes, presumably to permit unauthorised access. D. Gurney (NLA), 8 March 1996. Very rare 1940/41 coastal battery. Completely intact except for the covers of the gun platforms. Guns removed 1945/46. D. Walker (NLA), August 1996. Site remains intact; blocking of entrances apparently replaced. To southeast and soutwest are concrete block houses, with ventilation holes below roof covered in iron sheaths so air enters only from below. That to southeast is now a garden shed, that to southwest derelict. These are clearly part of the complex. E. Rose (NLA), 25 July 2003. The World War Two emergency coast defence battery and ancillary structures described above are visible as extant buildings on aerial photographs (S1-8), centred at TG 3092 3707. The battery is first visible on aerial photographs taken in 1943 (S1), and its absence from any earlier consulted photographs indicates that it was constructed between July 1941 and January 1943. It is one of several emergency batteries to have been constructed along the Norfolk coastline to counter the threatened invasion during the early years of the war. There are also numerous signs of military activity in the area immediately surrounding the battery, some of which might be connected with its use (NHER 39193). Other sites continue the line of coastal defences to the northwest (NHER 39197) and southeast (NHER 39195). The battery itself consists of two gun platforms projecting off the side of a roughly rectangular, semi-subterranean block. This provided accommodation and storage (S9). Disturbed ground and possibly concrete visible immediately in front of the battery in 1946 may mark the position of a related structure. A square, concrete building visible at TG 3088 3713 appears to have two storeys on early oblique photographs (e.g. S8) and may have been a battery observation post. It had been demolished by 1952. Two other small, concrete buildings (the blockhouses described above) are visible behind and to each side of the main battery, at TG 3089 3706 and TG 3096 3703. They are described as generator houses by a number of sources (e.g. S10). The Grand Hotel, 30m to the south-west of the site, might have provided domestic accommodation, and one source states that it was used as the battery observation post (S11). S. Tremlett (NMP), 7 January 2005. May-November 2004. Norfolk Rapid Coastal Survey. Context 437. Mundesley’s Second World War Coastal battery - two octagonal-shaped concrete platforms with iron gun mountings, a bunker complex, a concrete walkway and associated out-buildings. It is located on cliff top between TG 30918 37090 and TG 30955 37062. J. Allen (NLA), 25 April 2005. --- Unpublished document: Yardley, C.J.. 2011. The Mun Valley: Historic landscape Assessment and Landscape Character Assessment for Norfolk Coast Project.. p 16. <S1> Vertical Aerial Photograph: RAF. 1943. RAF AC/161 5117-8 04-JAN-1943 (NMR). <S2> Vertical Aerial Photograph: RAF. 1946. RAF 106G/UK/1430 4423 16-APR-1946 (NMR). <S3> Vertical Aerial Photograph: RAF. 1946. RAF 106G/UK/1634 2117-8 09-JUL-1946 (NMR). <S4> Vertical Aerial Photograph: RAF. 1953. RAF 540/1013 0022-3 04-FEB-1953 (NMR). <S5> Oblique Aerial Photograph: RAF. 1953. NHER TG 3037D (RAF 58/1006 0325) 04-FEB-1953. <S6> Oblique Aerial Photograph: Edwards, D.A. (NLA). 1984. NHER TG 3136D-E (NLA 157/AXX4-5) 31-JUL-1984. <S7> Oblique Aerial Photograph: Swain. NHER TG 3136Q-R (SWAIN 5A/11-2) n.d..
<S8> Oblique Aerial Photograph: Swain. NHER TG 3037E (SWAIN 16A/21) n.d..
<S9> Secondary File: Secondary file. <S10> Unpublished document: ?. ?. Defence Notes, derived from 'Old Maps in County Hall' IN Norfolk Industrial Archaeology Society military defence file. <S11> Newspaper Article: Kent, P. (EDP). 1997. Defences Battered by the Sea.. 15 February. p 29. <S12> Unpublished document: Robertson, D., Crawley, P., Barker, A., and Whitmore, S.. 2005. NAU Report No. 1045. Norfolk Rapid Coastal Zone Archaeological Survey. Assessment Report and Updated Project Design..